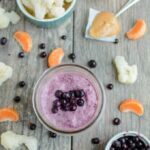 This Blueberry Cauliflower Smoothie is packed with vegetables, protein and healthy fats. Easy and kid-friendly, it’s perfect for a healthy breakfast or snack! Add all ingredients to a high-powered blender making sure the clementine is at the bottom. Blend until smooth. Add a splash of water or juice if needed to help blend.